On their previous EPs ‘Shōtotsu’ and ‘Kurushimi’, the group conjured a style of experimental jazz that seemed to be drowned in a thick, hallucongenic tar. Like a gradually expanding black hole, the band pulled elements of prog, drone and extreme metal towards itself while continually obliterating any sense of rhythmic or melodic centre. Now, with ‘What Is Chaos?’, Kurushimi have allowed their collective unconscious to run free. The result is awe-inspiring. Each of the album’s varied tracks stream by in a violent flourish of creative destruction. 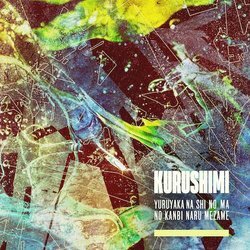 'Yuruyaka na shi no ma no kanbi naru mezame' is the new single from deconstructionist noise jazz ensemble Kurushimi.